Why Did We Go To Ukraine? Thinking the conflict was dying down we head into Ukraine. Unfortunately that turns out to be far from the case. However, on the drive from Lviv to Kyiv and Odessa we find a country seemingly determined to carry on as usual. We had good reason to think we could get a replacement for our specialist tyre in Ukraine and we did. Map, more photos and information on driving in Ukraine below. 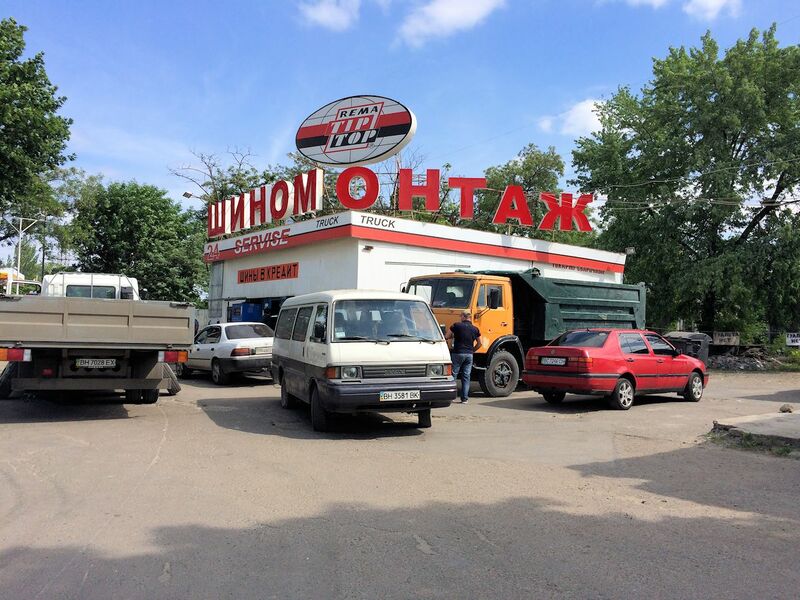 We asked ourselves why we were in Ukraine many times during the anxious wait for a new tyre, and while – separately – dry heaving into the toilet bowl through the night. There is no pretty answer, except maybe that we wanted to spend some money in a country brought almost to its knees economically in the aftermath of last year’s revolution. The depressing answer is that we went to Ukraine while we still can. During the planning stages it seemed as though the conflict in the east was steadily dying down. However, in the time we were there skirmishes intensified amid official claims of a large troop build-up just over the Russian border. This weekend there are unverified reports of armed columns moving towards Ukraine from Taganrog. If it still seems highly unlikely the fighting will spread to the west of the country – and the magnificent cities of Lviv and Kyiv (Kiev) – we were less certain of the situation in Odessa in the south. There is little doubt that the Russian-speaking port city is loyal to the Ukraine government. On the day we left the president took the extraordinarily bold step of appointing the former Georgian president – from across the Black Sea – as the regional governor. Nevertheless, it remains a potential strategic aim of the separatists to not only to build a ‘land bridge’ to Crimea from the Russian mainland but also to deprive Ukraine completely of its coastline. That puts Odessa in the firing line, however notional that may appear at the moment. Despite all this, there was no sign of any anxiety. Life seemingly goes on absolutely as normal. Aside from our own worries, we came uncomfortably close to having a carefree holiday in Odessa, strolling the crumbling stucco streets laid out in a grid pattern by Catherine the Great, climbing the Potemkin Steps, staying in a really fabulous hotel, eating great food – just avoid salads – and staring out to sea from the city park above the port and beach. The nearest we came to discussing the situation was while waiting for the computer system to reboot at the tyre depot. One man simply remarked they had seen fewer tourists than normal recently. First sight Ukraine (Kyiv is the Ukrainian spelling of Kiev). After a relatively straightforward – though thorough – procedure crossing the border, the only thing left to do now is buy ‘Green Card’ insurance. See Driving Outside of the EU. 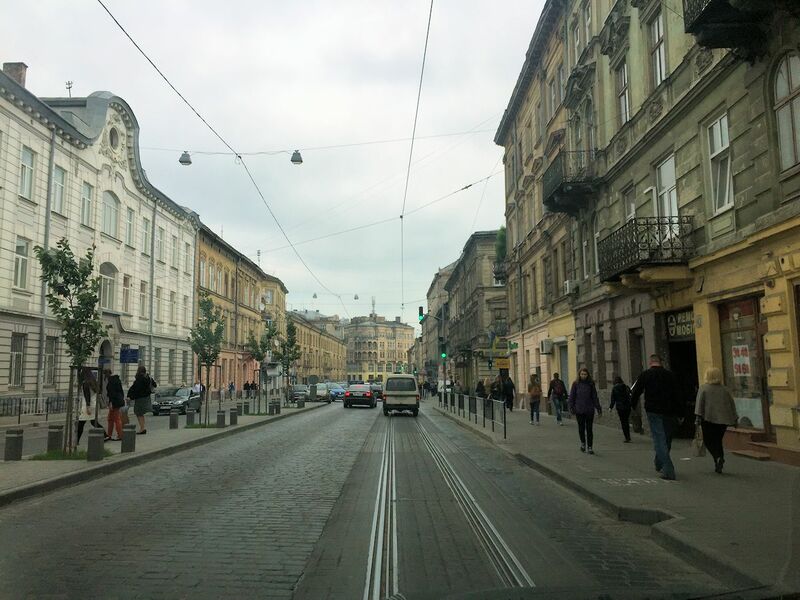 The former capital of Austrian and Polish Galicia – and before that of the Russian Kingdom – the historic centre of Lviv survived Nazi and Soviet occupation almost unscathed (though the cobbled road in from the west is comically bumpy). It is now on the UNESCO World Heritage List. At just 70km from the Polish border it is unfortunately too soon for us to stop for the night, despite the grand hotels. 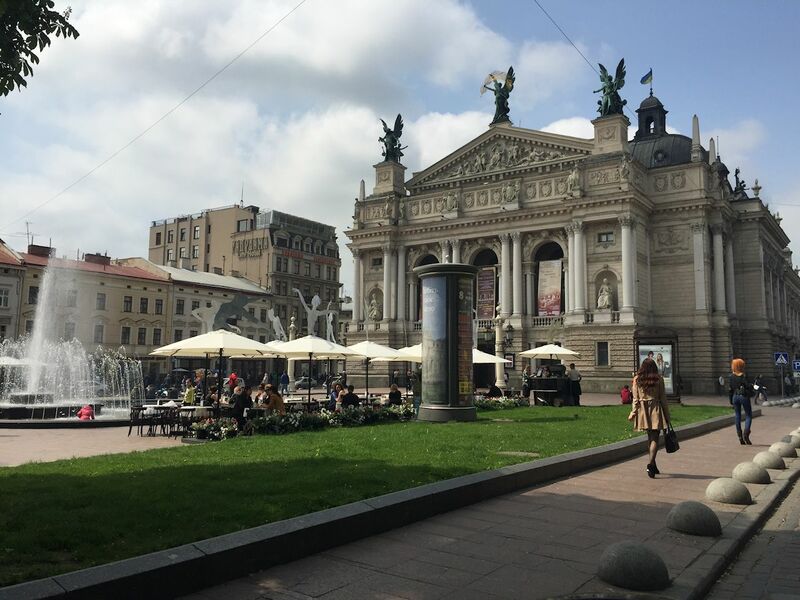 Lviv Theatre of Opera and Ballet, 1897, built on innovative concrete foundations over the Poltava River. Cyrillic. 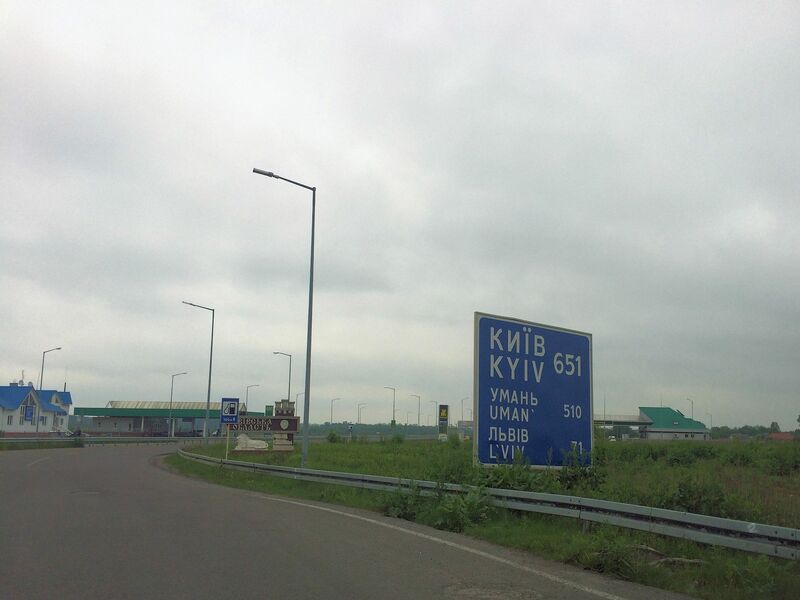 Fortunately all road signs are in both Cyrillic and Latin script, at least in the north and west of Ukraine, save for the odd Soviet-era town sign (in this case painted with the Ukraine national colours of yellow and blue). Meanwhile we are impressed with the state of the roads. There are occasional bumpy sections but few actual potholes. 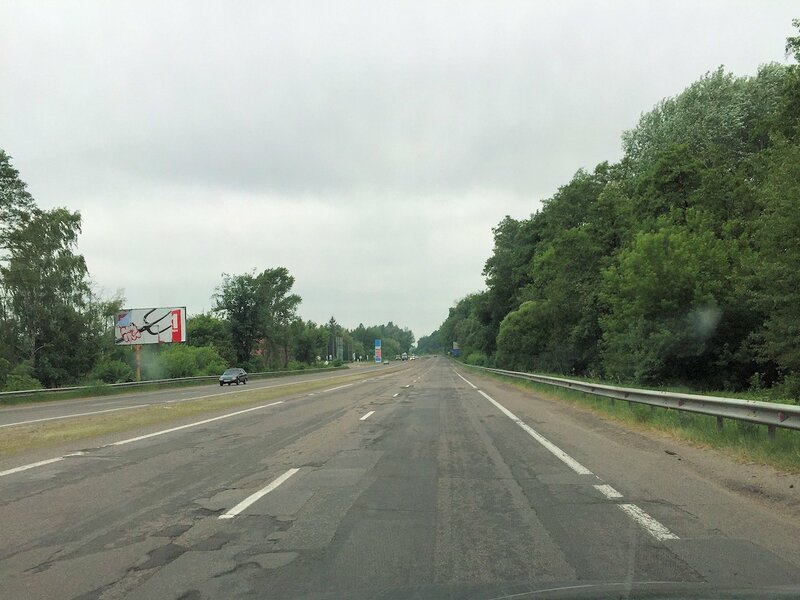 Up to Rivne, about halfway to Kyiv, the road is either wide single lane or alternate 2+1. From there it is dual carriageway albeit with regular pedestrian zebra crossings. 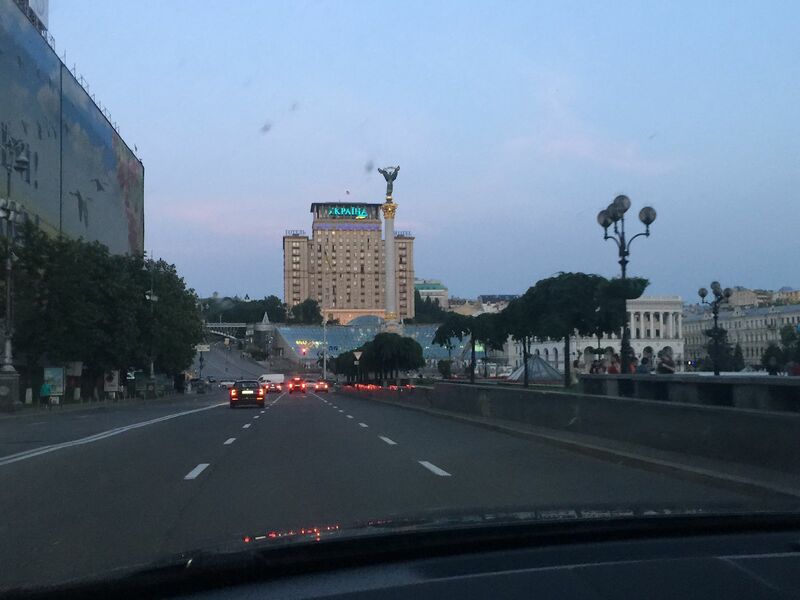 We reach Kyiv at dusk after around six hours driving from Lviv, entering the city centre through Maidan Square, head on to the landmark Hotel Ukraine. This state-run establishment, built during the Stalin-era, is both elegant and opulent (and very cheap), with a fantastic view over the city, but needs updating. 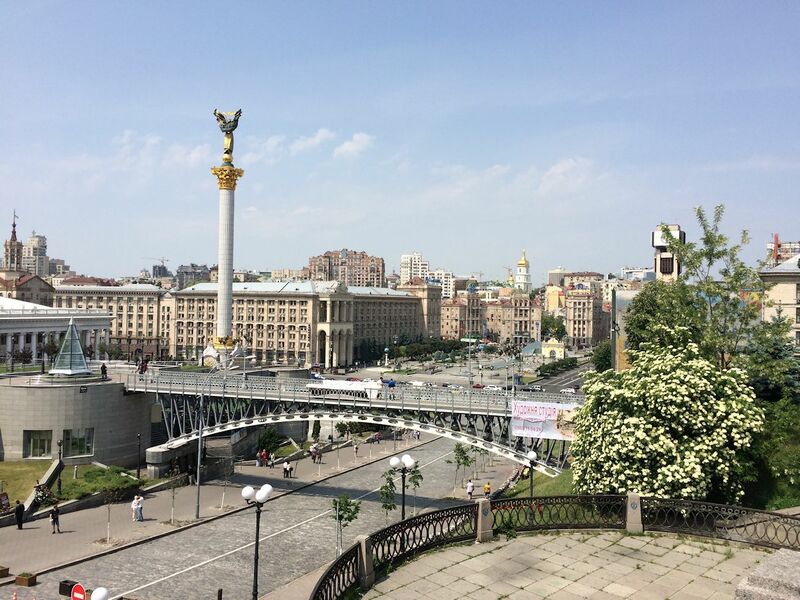 Alternatives include the Fairmont beside the river, the Intercontinental near St Sophia’s Cathedral or, just down the road from Maidan Square, the friendly Dnipro Hotel, also with great views. 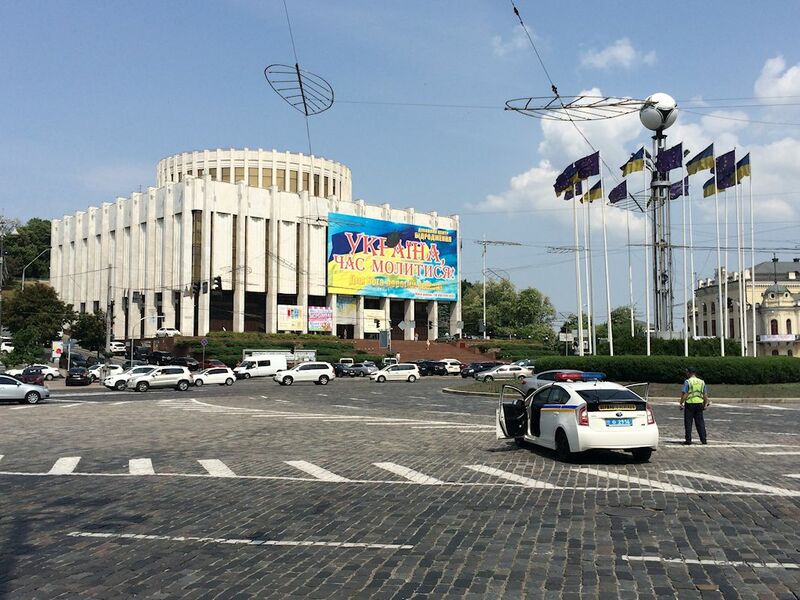 Maidan Square from the side of Hotel Ukraine. Tributes to the people who died during last year’s protests, both here and in nearby Hrushevskoho Street, dot the square, one of the few remaining physical signs. The courage of those who returned to the barricades during the three days of sniper fire in late February 2014 – in which eighty people died – is a personal benchmark. The Ukraine House exhibition centre on Europe Square, Kyiv, at the junction of Kreschatyk Street – Kyiv’s main shopping street which runs across Maidan Square – and Hrushevskoho Street. Ukraine traffic police, in their distinctive Toyota Prius hybrid squad cars, are notoriously corrupt but recent American aid has attempted to address the problem, successfully it seems. We were stopped just once, at one of the regular 90-70-50kmh zones where the police hang out. After a quick visual check we are sent on our way. Discerning the speed limit on the open road is an issue because the maximums are not signed (the ‘motorway’ limit is 130kmh and 110kmh on highway). We settled on a 115kmh cruise. 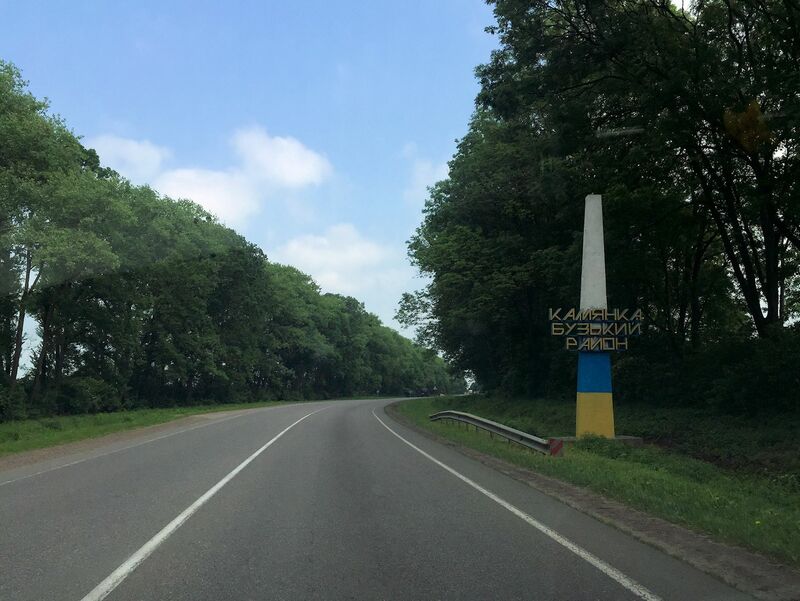 The road for the first hundred miles or so – of the three hundred from Kyiv to Odessa – is very bumpy though, as before, there are few actual potholes. It’s ironic that when we do lose a tyre it is to a random lump of metal in the road, long after the surface has smoothed out completely. The landscape starts off flat then turns gently rolling further south. 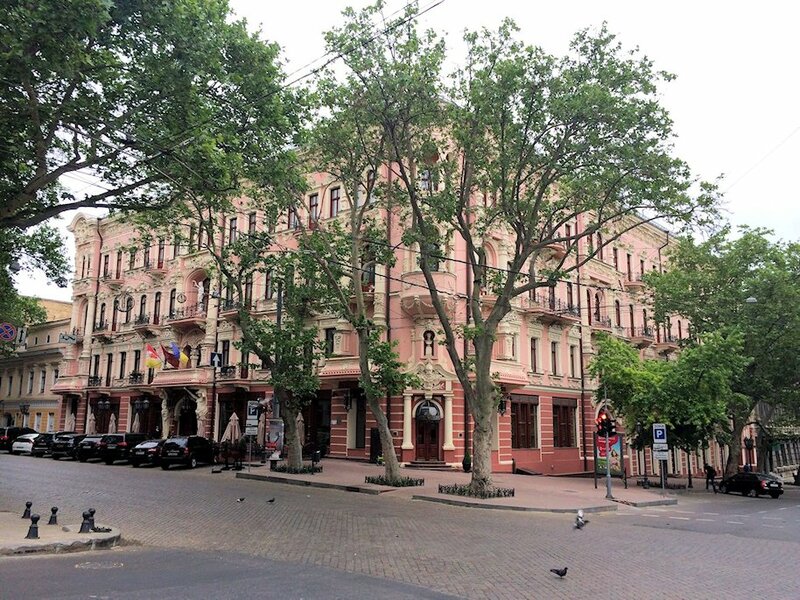 Typical of Odessa architecture – and bright colours – is the fantastic Bristol Hotel, designed by official city architect Alexander Bernardazzi in 1899. Not all of the buildings are in as good a condition as the Bristol but many are being renovated. This full-service, five star hotel cost us just €150 per night, i.e. less than half the price of a comparable place in Western Europe, with standards to match. At a short walk from the city centre, and the car parked outside under the watchful eyes of the fearsome doormen, why would you stay anywhere else (though there are plenty of boutique-style hotels in town)? Unfortunately it seems the high-rise Hotel Odessa at the bottom of the Potemkin Steps is no longer open. 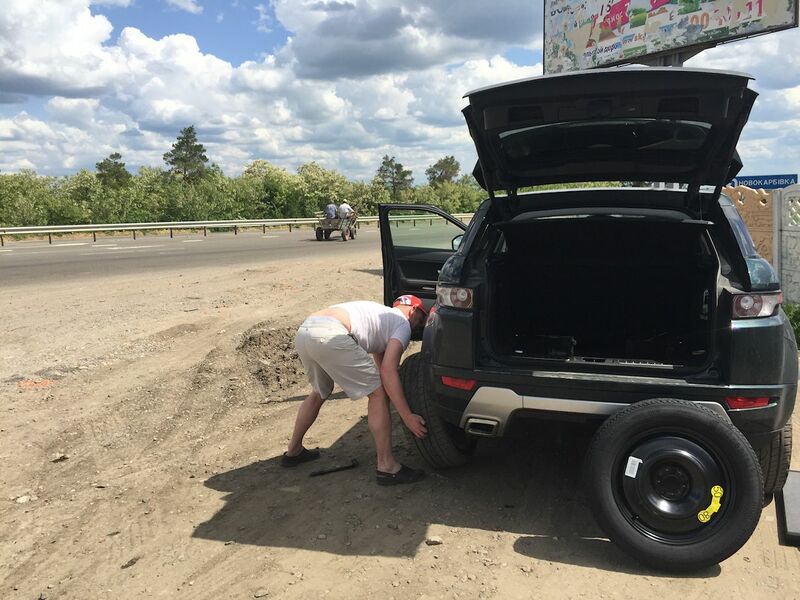 After busting a tyre in Bulgaria two years ago, and quickly finding a new one, we knew all was not lost after a puncture on the road to Odessa. Nevertheless it was an anxious two day wait ahead of the weekend for a new one to arrive. The Land Rover dealer recommended the branch of ‘Tehnoopttorg-Trade’ up the road who not only found us a tyre in time – of precisely the same brand and type, even including the M+S all-season markings – but also escorted us to the local fitter, above, and refused a tip. ‘Eternally grateful’ does not come close. It’s 150 miles from Odessa to the Romanian border at Izmail but crossing there is impossible thanks to the protected Danube Delta wetlands. There is no other way to leave south west Ukraine except via Moldova. 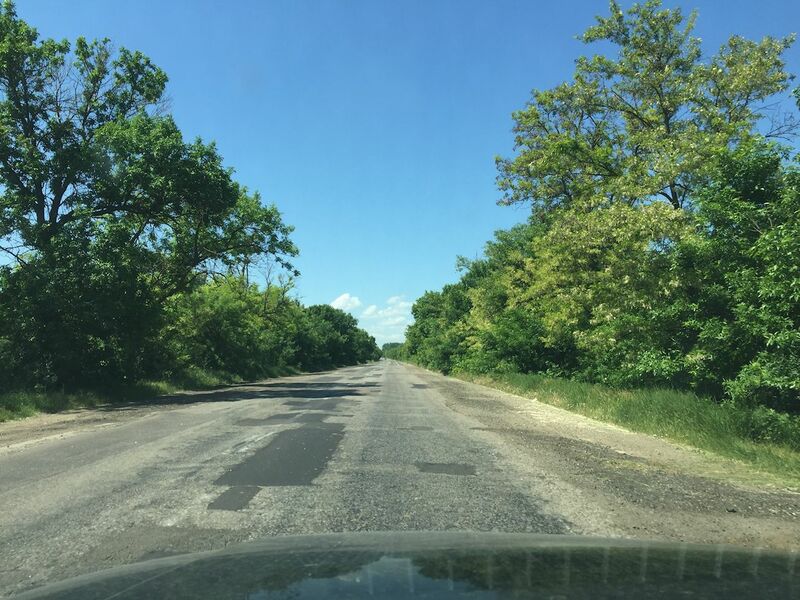 Well connected British expat writer Nikolai Holmov, aka ‘Odessa Blogger’, says a useful way for the new governor to make his mark would be to push for this E87 road to be upgraded. We wholeheartedly agree. Driving through Moldova was no hardship for us, despite the two international borders – the road are mostly great while parts of capital Chisinau were also designed by Bernardazzi – but a direct, good quality road connection to Romania, Bulgaria – Turkey – and, eventually, Western Europe would surely be his best inheritance.